With a third qualifying time for Goerke, and a seventh for Epstein, the day started well enough for the duo. But right after the gate dropped for Moto 1, things looked less promising when Goerke was taken down in the first turn by another rider. Unfortunately, Epstein, who was in close proximity to Goerke, also went down in a domino effect that saw multiple riders follow suit. Colton Facciotti, one of the lucky ones to escape the carnage, went on to win the moto ahead of second-place Kaven Benoit and third-place Cole Thompson. Although Goerke managed to remount and get back into action at the back of the pack, Epstein was left on the outside looking in. His bike sustained enough damage in the pileup to negate any chance of him finishing the race. It was a bitter pill to swallow for the No.7 ranked rider, having to sit out the first moto of the season on the sidelines. Goerke, meanwhile, pinned the throttle of his potent YZ450F and started picking off rider after rider on the rough and tough Wild Rose track. Breathing fire to connect with the frontrunners, however, saw Goerke go down for a soil sample on his own, this time, about halfway through the moto. True to form, the Florida native put the crash quickly behind him and with the odds against him still soldiered on to grab a noteworthy sixth-place finish at the checkered flag. In a déjà-vu scenario, Goerke got taken out again by another rider at the start of Moto 2; this time in the third corner while running in ninth place. By the time he was back on his bike he had dropped to mid-pack. Once again, he had his work cut out for him. Epstein, who had also enjoyed a top-10 start, fared much better than in the first moto. By the halfway point the Californian had nimbly battled his way into second place behind Facciotti, who again had control of the lead. With a sizeable gap between himself and the multi-time champ, Epstein’s main focus was to maintain second till the finish line, something he had no trouble doing. Goerke, intent on joining his teammate on the podium, dug deep, slicing his way through the pack from 18th place to settle into third, with about four laps left to go. 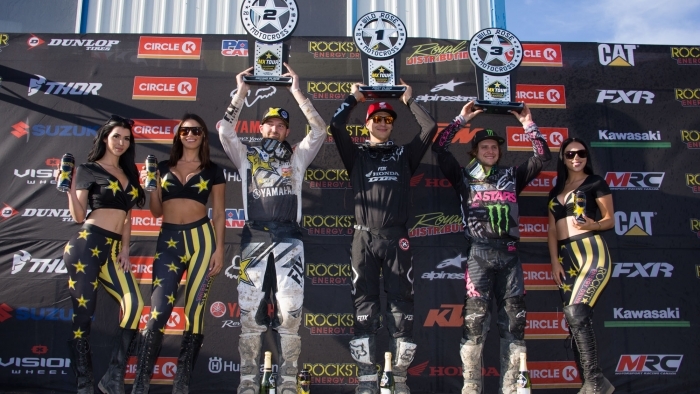 It was comeback worthy of the defending 450 Pro Champion. “Overall it was a good weekend, even though Dillan had to deal with a first moto DNF. As a team we made a lot of progress, going forward. We’re all just excited to get into Round 2 now, with the new series, first race of the year nerves gone, and see what we can get down for the next eight rounds,” team manager Steve Simms said. The Rockstar Energy Triple Crown Series continues with Round 2 of the MX Tour in Popkum, BC on Saturday, June 2.